It can be difficult to accept that you have begun to age, especially when the process is causing you to appear older than you actually are. Factors such as genetics, lifestyle, and the environment can all speed up the aging process, leaving you with a less than desirable facial appearance. Facial sagging, deep creases, and a loss of muscle tone can all rob you of an attractive, youthful facial contour. Facelift surgery targets the common signs of aging in the lower third of the face, erasing problem areas to restore a more firm and smooth complexion. 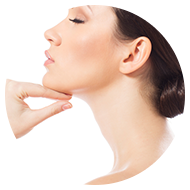 Your facelift procedure is tailored to specifically highlight the contours of your facial structures. A number of techniques may be combined to provide you with the complete and satisfactory results you desire. Incisions are placed discreetly in the hairline to conceal scarring. Your incisions will often run along the ear, around the earlobe, and along the lower scalp. 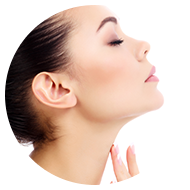 Patients who require correction of the neck may have a secondary incision placed under the chin. The full length and extent of your incisions will depend on the correction required to help you achieve your ideal results. A loss of fat along the cheeks can lead to a loss of youthful facial volume. During your facelift, fat can be distributed under the skin to create better contours and restore fullness to the face. Fat distribution is not a necessary component of every facelift, and it will be recommended if volume loss is the cause of a lack of facial definition. Facial implants may also be recommended if needed to achieve the face shape you desire. A quality facelift focuses on the deep muscular layer of the face. Drooping muscles are the main cause of a sagging facial appearance. Lifting the deep muscular layer vertically helps restore a firmer facial aesthetic and will positively affect the quality and life of your results. The final process in any quality facelift is trimming away excess tissue. Once the facial muscles have been repositioned, the skin is draped to highlight your new facial contours. It is important that only excess skin is trimmed away and that the skin is never pulled too tight across the face to avoid an obviously “windswept” look. How long does it take to recovery from facelift surgery? You will experience bruising and swelling of your face, and a temporary tube may be placed to drain excess fluid. Most patients return to work within two weeks of their procedure. You can resume your regular physical activities three to four weeks following your procedure, but your skin may be discolored for several weeks. You should avoid direct exposure to sunlight throughout your recovery. Most major swelling will subside after six weeks. Will there be scars as a result of my facelift? Dr. Doezie attempts to place all incisions within the hair of the scalp to mask all scarring. However, some patients do not have adequate hair grow, and other healing factors can cause visible scarring to develop. Most scarring can be covered with makeup after two weeks and is likely to fade over time. The cost of facelift surgery will vary based on the geographical location of the surgery, the technique used, and the surgeon who performs the surgery. The highest price does not always indicate the best quality of service. It is important to choose a surgeon who is experienced and highly skilled in the procedures you are choosing to truly get the most out of your investment. According to the American Society of Plastic Surgeons (ASPS), the 2015 national average surgeon fee for facelift surgery was $7,286. This does not include the cost of anesthesia, operating room costs, or the cost of pain medication. What kind of results can I expect from facelift surgery? 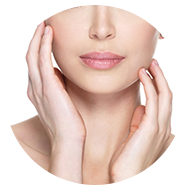 Facelift surgery provides you with long-lasting results that can remove years from your appearance. However, facelift surgery cannot halt the natural aging process. Taking care of your skin and avoiding direct exposure to sunlight and other harmful environmental factors can help prolong the quality of your results.